There is no doubt that Star Wars Episode IX is one of the most eagerly anticipated movies of the year. Director J.J. Abrams’ upcoming movie will put an end to a trilogy which began back in 2015, with moviegoers finally being able to discover the fates of characters like Rey, Finn and Poe Dameron, amongst others. J.J. Abrams’ conclusion to this first Disney-era trilogy of Star Wars movies is also eagerly awaited due to the fact that Rian Johnson’s Star Wars: The Last Jedi left a bitter taste in some people’s mouths due to its treatment of the source material and its portrayal of certain characters like Luke Skywalker. And although it’s not that long before Episode IX hits cinemas (J.J. Abrams’ movie will debut on December 20 this year), we now know that it may be a while before we see another Star Wars movie after Episode IX comes out, as Disney’s CEO Bob Iger has said as much in an interview with Bloomberg (via IGN). “We will take a pause, some time, and reset”, said Disney’s CEO. “There will be other Star Wars movies, but there will be a bit of a hiatus”, added Iger. This means that it may be a while before a new Star Wars trilogy being worked on by director Rian Johnson, or new movies based on characters like Boba Fett or Obi-Wan Kenobi hit theatre screens, for instance. The reason for this might be the fact that Solo: A Star Wars Story underperformed last year – actually, despite the mega-blockbusters that Star Wars: The Force Awakens and The Last Jedi were, Solo: A Star Wars Story failed to be a box office success for Disney. But despite the fact that we may have to wait a while longer for new Star Wars movies arrive after Episode IX comes out, at least we now know more about J.J. Abrams’ upcoming Star Wars flick, as new details were revealed during this weekend’s Star Wars Celebration event in Chicago. What’s most interesting is that this new movie (which is titled “Star Wars: The Rise of Skywalker”) will not take place immediately after The Last Jedi, rather time has passed between the events of the 2017 movie and the upcoming Episode IX. “The movie doesn’t pick up immediately after the last film – some time has gone by”, said Abrams at the Star Wars Celebration event. Also, actress Daisy Ridley (who plays Rey in the movie) said that, in Episode IX, Rey has had time to sift through the books she picked up on Ahch-To. This was the island where she was taught about the ways of the Jedi by Luke Skywalker, and where the Jedi Temple (which Luke sets on fire near the end of the movie) was. This means Rey may have learned a thing or two from the old Jedi texts, and I’m looking forward to seeing what this is when the movie hits theatres. 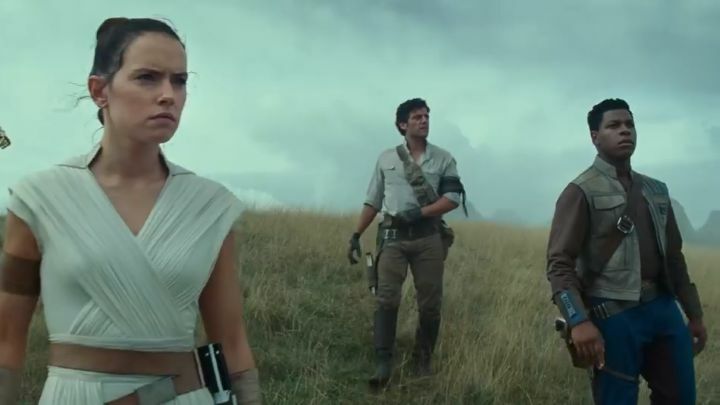 Aside from this, there’s now a teaser trailer of Star Wars: The Rise of Skywalker available (see below), showing off this hotly anticipated movie. One thing which begs explanation, though, is the movie’s title – “The Rise of Skywalker”. With Luke out of the picture after the events of the previous episode, the title strongly suggests that one of the movie’s characters has some tie to Skywalker (Rey maybe) and this could be an interesting plot arch in this Star Wars film, especially with J.J. Abrams’ recently hinting that the subject of Rey’s parentage will be revised in Episode IX. The Rise of Skywalker might just refer to the fact that Luke is returning in ghost form – like Obi-Wan did in Return of the Jedi – something which would be interesting too. What’s clear is that Mark Hamill will play a part in this movie too, as his voice is heard in the teaser trailer above, while Carrie Fisher, who passed away in late 2016, will also appear in Episode IX thanks to the wonders of digital technology, and unused footage from the earlier episodes as well. We still have to wait until December 20 (the movie’s opening date) to find out how things will play out in Star Wars: The Rise of Skywalker, but hopefully this will be another memorable entry in the Star Wars saga like The Force Awakens when it hits theatres later this year.